Feeling good vibrations- a Fun experiment! The Scottish born Alexander Graham Bell moved to Boston with his deaf parents in 1870 and became a teacher of the deaf. He fell in love with one of his students, Mabel, a young woman of 17 years, who had lost her hearing in childhood through contracting scarlet fever. To help Mabel and some of the younger children at his Boston school avoid collisions with horse- drawn carriages approaching from behind, he conceived a simple idea: If they walked outside holding a balloon they would feel the sounds made by the carriages through their fingertips. Alexander realized that the balloon's surface would tremble in sympathy with the sound of the approaching carriages and alert the children to their presence. It was this simple idea that led him to invent the telephone because he realized that if the sound of a voice could move a membrane by a tiny amount, that movement could be converted into an electric current fluctuating in sympathy with the voice sounds. Try Alexander's experiment: Hold a balloon very gently in your fingertips (if you have long nails make sure your skin touches the balloon's surface, not your nails.) 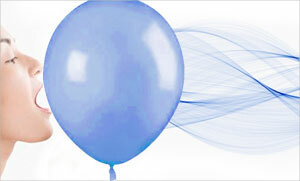 Now, bring the balloon close to your mouth, close your eyes and make a low-pitched ‘oo' sound while focusing your attention on your fingertips. You should easily feel the sound of your voice through your fingers. But apart from the fun you'll have doing this, it's a wonderful reminder of the bubble nature of sound because a balloon is bubble- like and you will feel the trembling of its surface, almost as though you could see the trembling sound bubble coming out of your mouth as you speak. Cymatic patterns are easy to create using a simple drum placed on top of a speaker (with the speakers pointing up into the shell of the drum. Then you just add salt, flour, or any kind of light powder. The recommended stuff is Poppy Seeds but you can use many different types of material and interestingly any color, which, as the skin vibrates, the colors tend fall into their own specific spectrum which is another great phenomenon of cymatics. You then simply have to fire a frequency through the speakers, this can be done using an electronic keyboard, or a tone generator as long as you can produce a waveform signal at a specific pitch. Margaret Watts-Hughes, a Welsh woman, experimented with a device she invented in 1885 and named the 'Eidophone.' Her invention consisted of a wooden resonating chamber with an open end across which was stretched a rubber membrane, strewn with sand and other media. She was able to take impressions of the voice figures by applying a coated glass plate onto the moist forms although it is not known what form the coating took. 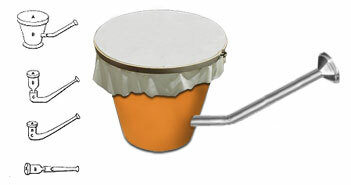 Try Margret's experiment: In some instances you can modify a flower pot or any cylindrical vessel, tightly stretch indian rubber over the top, a wide-mouthed tube of convenient shape into a hole near the bottom of the pot, srinkle your fairy dust onto the top and sing into the tube at pitch. Watch the complex patterns that appear as you sing at different amplitudes and pitches. Truly amazing! German musician and scientist, sometimes known as 'the father of acoustics,' almost certainly had access to Hooke's work but it is Chladni who history has chosen to acknowledge for his major study of this class of phenomena. Try Chladni's experiment: The Chladni plates are probably the most basic and simple way to see cymatics in action. Take a flat sheet of metal, either circular or square, and mount on a central stalk to a sturdy base. Then sprinkles fine sand or salt on top of plate. Hold the plate with your finger or thumb at a point on the edge. Begin to stroke the side of the plate with a Cello or Violin bow. The plate will ring loudly if you manage to excite a mode of vibration! The sand will begin to bounce about on the plate until settling at nodal points (areas of zero movement) thereby producing intricate patterns. Where the bow strokes in relation to your finger will dictate which mode of vibration you excite. For simplicity, maybe start by holding a corner of the square plate, stroking the middle of a side, or stroke the circular plate 45° around from your finger.